Big Time Attic, the Minneapolis cartooning studio where Zander Cannon ’95 and Kevin Cannon ’02 (no relation) forged their business partnership and later launched solo careers, is a little like your favorite bookstore, toy store, and coffee shop combined. It exudes fun and promises delight. After the animation partner left in 2007, Zander and Kevin focused on illustration and storyboarding. Looking at the work later, Zander says he often couldn’t tell whose work was whose. “It was really good to spend five or six years doing whatever came across, especially adapting to technology,” Zander says. “When I started, computers were barely even a part of it. Everything was done on paper. I was shipping artwork that’s irreplaceable all over creation, hoping it gets there, hoping it gets back. Over the years, they worked on many nonfiction books — about space, evolution, rhetoric. "There's essentially no money in this business so you should always follow your passion. 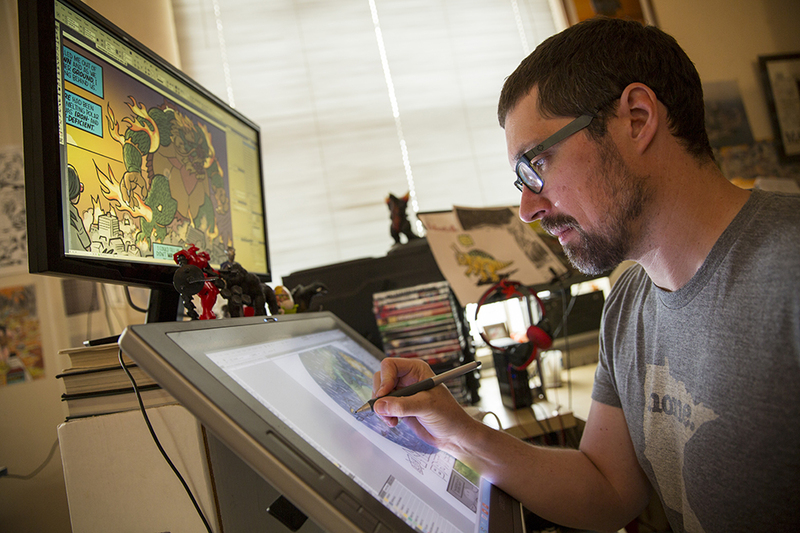 Since fall 2014, Zander’s passion has been funneled into his own monthly comic book series, KAIJUMAX, about giant monsters in a maximum-security prison. “It’s for diehard fans of monster movies and prison movies. It’s so genre-based,” Zander says. It takes him five or six weeks to create a comic. “I’m writing and penciling and inking and lettering and coloring. I’m writing the letters pages. Basically everything. I have one assistant on colors,” he says. “I used to be a little more like let’s jump in and do page one. Now when I’m doing KAIJUMAX, I do it all visually before I write a word because that gives me the pacing of it, and I make sure there are no boring panels. They all have to communicate something visually. The series has a six-issue season, similar to a TV season. “Then I get a break,” Zander says. 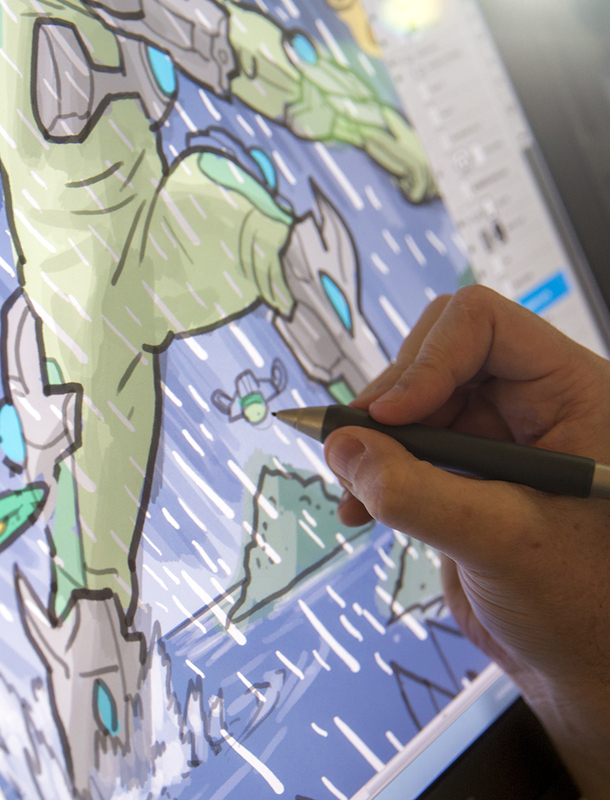 With all the work involved in producing a monthly comic, he no longer takes on clients. “All the stuff that I used to be doing I can’t do anymore,” Zander says. In 2014 Kevin co-wrote The Cartoon Introduction to Philosophy, published in 2015 by Hill and Wang. His co-author, philosopher Michael Patton, supplied a prose document that provided the chief narrative conceit of a river and the basic points of view of the major philosophers. “I took the master document and broke the whole thing down into an outline to try to tease out what the major elements were,” Kevin says. “I created a script out of it, which was actually kind of easy after doing 1,000 pages of personal graphic novel stuff. At a certain point, you get into the rhythm. I could see a joke clearly goes here. Here’s a good page break. “Twenty years ago you could be a letterer,” Zander says. “You could be an inker. You can’t be that anymore. You have to be a creative person with a lot of abilities or you have to be a graphic designer. You can’t be a drone anymore in comics because computers have taken all that away in a good way. “I wanted to be a newspaper cartoonist, like Calvin and Hobbes or Garfield,” Kevin says. “Doing the cartoon for The Scarlet & Black was my way of feeling out that process. I had so much freedom, I realized I could never do this professionally.” He drew Johnny Cavalier all four years at Grinnell, in addition to trying other gag strips. Kevin also contributed to The Grinnell Magazine for nine years.